Over the decades snorkels for scuba diving and snorkeling have seen quite a bit of innovation. In the old days there were only wet snorkels with uncomfortable mouth pieces. One thing that you could count on in those days was that you’d end up drinking a lot of water. Development slowly moved from these wet snorkels to semi dry and dry snorkels. Specifically, the dry snorkels had real design flaws in the early days. They were dry when you went under water but once you surfaced again they more often than not didn’t open up again so you had to completely come out of the water to get some air. These days are thankfully over. The design and technology has evolved and today these snorkels work reliably and yes, they do stay dry. That is if you are using a dry snorkel. Today you can even have full face snorkel masks with integrated dry snorkels that work wonderfully. Now, not all things are great about that. While in the old days the snorkel did fill with water, that had advantages when you had the snorkel with you while scuba diving. They didn’t produce any buoyancy. You want to keep that in mind if you are looking for a new snorkel. A dry snorkel will be air filled and cause upward lift. A semi-dry snorkel will fill with water which makes it easier when you dive. The basic rule is that it’s great to get a dry snorkel when you snorkel but not when you dive! But these are not the only considerations to think about. You want to make sure that the mouthpiece fits comfortable. That depends on the size and material of the mouthpiece. If you have a small face or have kids, then you also have to make sure that the snorkel you get fits the size of the head. Besides dry, semi dry and wet snorkels, you also have the choice when it comes to the tube. It can be flexible or rigid. 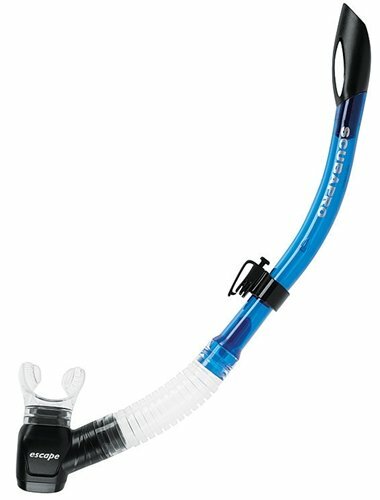 The rigid snorkel is basically a solid plastic tube with a mouthpiece. They are typically bent to somewhat fit a generic form of a face. These are basically the same design as what was used since the old days. That also means that they typically are wet snorkels. Once you get them under water the tube will fill with water. When you come above water again you will have to clear the tube with a forceful blow of air. Modern snorkels are usually somewhat flexible. Many, if not all, have a purge valve to be able to get the water out without needing too much air. Below we go more into the details on different options and terms around snorkels. Snorkels that consist of a flexible tube are usually more comfortable to wear. They tube is not a single rigid piece of plastic pipe. Instead there is a flexible piece of pipe where the snorkel bends between the attachment point and the mouth piece. The result is a better fit no matter what shape your head is. Another benefit is that there is less pull on the mouthpiece. Additionally, you can adjust the mouth piece and the top of the snorkel so they sit at a better, more comfortable angle. Lastly, when you let go of the mouthpiece, it pulls away from your face and is not in the way. Most modern snorkels have a purge valve. They are designed to have a bottom part underneath the mouth piece where water coming down the snorkel tube collects. This area is below your mouth so that the collected water will not get into your mouth. Small amounts of water will collect there. At the very bottom of that collection area you will find a valve. When you blow into the snorkel the valve will open and the water will be forced out. This requires much less effort than in old designs where you had to blow really hard to force the water out the top of the snorkel. The disadvantage is that dirt or sand can get into the valve. At that time it might no longer work and you will have to give it a good cleaning. A splash guard sits on the top of the snorkel. It also is what makes a snorkel a semi-dry snorkel. Most of these snorkels have a flexible tube and a purge valve. The splash guard prevents water and spray to enter the tube. It does not prevent water from entering the snorkel when you dive. Also if a sizeable wave rolls over your snorkel, water will come in. It does prevent a lot of splashing water from entering the snorkel. This makes it a lot more comfortable to use than a wet snorkel. Allowing the snorkel to fill with water when diving makes it a great choice for divers. The dry valve sits on top of the tube. It prevents any water from entering the snorkel. In the early days of dry snorkels these dry valves often did not work as desired. They either didn’t create a tight seal and water entered the snorkel or they closed up when they were supposed to be open. That prevented air to come in which is certainly anything but a good thing. Modern designs do not have those issues anymore. They work reliably and keep the water out and let you breathe when you have to. The valve completely seals when you go under water and then opens up again when you get above water. As the snorkel will not fill with water when you go under water, it does create buoyancy through the air trapped in the snorkel. This makes it harder when you dive to get down. On the other hand, it makes it perfect when you only want to snorkel. Should you end up diving with a dry snorkel then be aware that when you dive down to more than 15 or 20 feet your tube might collapse. 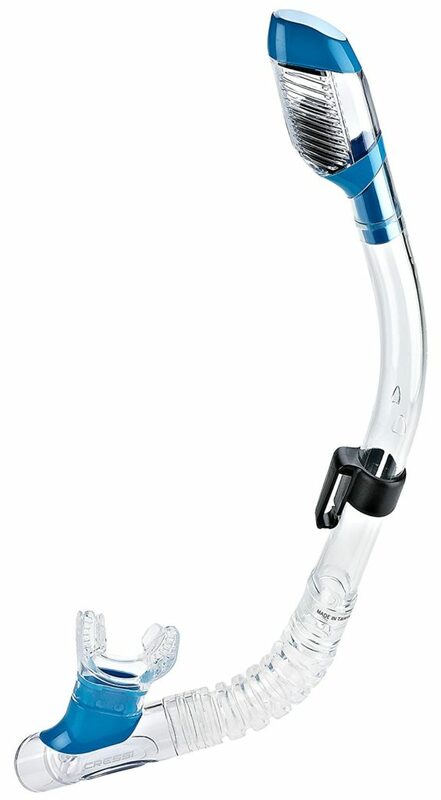 The air inside the snorkel can’t withstand the pressure of the surrounding water anymore and the flexible portion of the snorkel can (will) collapse. Nothing to be too worried about but it can be a surprise when it happens. What kind of snorkel should you buy? That depends very much on what you want to use the snorkel for. If you want to snorkel and not dive then you definitely want a dry snorkel. One of the best ones you can get is the Cressi Supernova Snorkel. It’s completely dry and is very affordable. It is ergonomically shaped and will fit your head nicely. It has a purge valve and has a highly flexible tube. If you want to dive with the snorkel, then get a semi-dry snorkel. It will fill with water during a dive which makes it easier to dive down. The splash guard will prevent the splashes of water come in while you snorkel but then it does not create buoyancy when you dive. 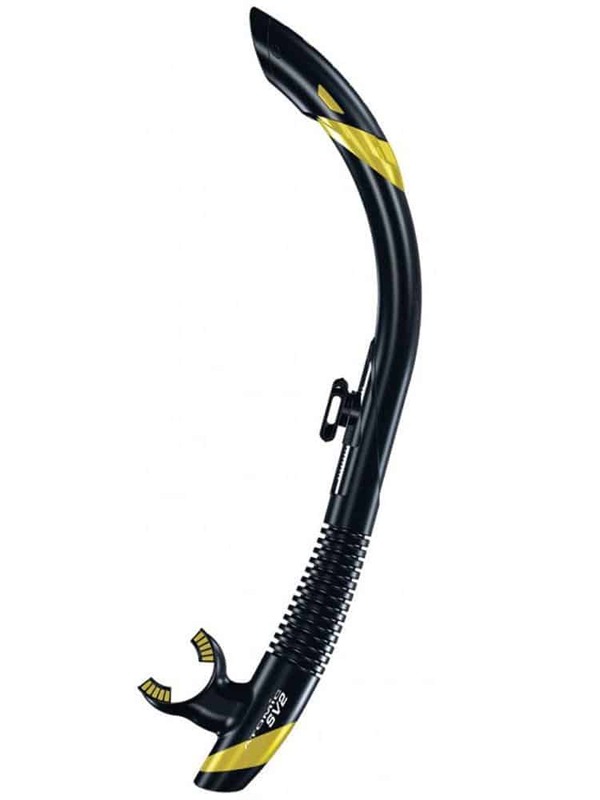 A great semi dry snorkel to get is the ScubaPro Escape Semi-Dry Snorkel. It has an large draining chamber to collect water and is overall highly rated by customers. Besides the points we have made above, you also want to think about the following points. Another alternative to a traditional scuba mask and snorkel is to get a full-face snorkel mask. The advantage is that they cover the whole face which allows you to breathe through your mouth or nose. There’s no need for a mouthpiece! These masks are usually very comfortable to wear and they stay dry. The large window allows for great visibility under water. Have a look at our best full-face snorkel masks review to learn more about these kinds of masks/snorkels. You’ll have a hard time to break a mouthpiece of a modern snorkel. However, it potentially could happen and it would be good to know that the mouthpiece can be replaced without having to replace the whole snorkel. Now, having said that, the snorkels nowadays are very affordable. Even the best snorkels can be had for under $50. So, while it theoretically is a consideration to be able to replace a mouthpiece it really is not worth thinking about it too much. When traveling it is usually necessary to separate the snorkel from the mask strap. Many snorkels today have releases that make it easy to remove the snorkel from the mask. It’s not a concern for the quality of the snorkel itself but it does make it easier to travel with your mask and snorkel. The size aspect of a snorkel is mainly related to the size of the mouth piece. A smaller person typically will have a smaller mouth and as such would be more comfortable with a smaller mouthpiece. In addition, a smaller person will most likely have a lower lung capacity. So, if you are smaller and you’re getting a wet snorkel then don’t forget that you have to blow hard to get the water out of the snorkel. It would be more comfortable to have a tube with a smaller diameter that will require less air to blow the water out. The same reason(s) make it important to have a kid-sized snorkel for kids. They have an even harder time using an adult snorkel and blowing it out. A great kid sized snorkel that is dry is the Cressi Junior Dry Snorkel. Modern snorkels work reliable and help you to snorkel or dive. If you want to snorkel then you’re best off using a dry snorkel. Divers will want to use a semi-dry snorkel which allows for easier diving. If you like to both snorkel and dive then you’re best off to simply buy two snorkels. They are pretty cheap and you won’t have to compromise on either activity.